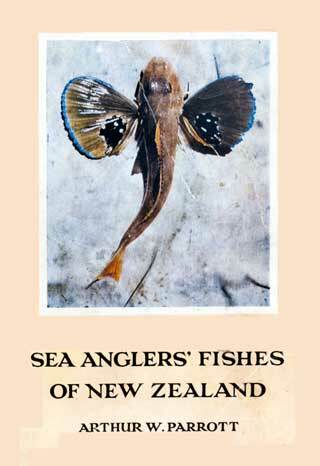 Sea Anglers’ Fishes of New Zealand by Arthur W. Parrott. Published by Hodder and Stoughton Limited, London. First printed 1957. Size: 210mm x 145mm. 176pp total. Including 6 pages of black and white photographs. 56 fish species covered each with a black and white line drawing. Hardcover with colour dust jacket. This book is a reliable guide and reference for the ordinary man or woman who is interested in fish, but who is without special knowledge of biology and has not the time or money to acquire a library on New Zealand fishes. In this volume, 56 different kinds of fish are described and illustrated, including almost all the species that are likely to be caught by the amateur or commercial fisherman. All the important food fishes with the exception of flatfishes are included. This latter, together with eels, big game fishes and other fish, are the subject of the companion volumes: Big Game Fishes and Sharks of New Zealand, and The Queer and the Rare Fishes of New Zealand. Arthur W. Perrott was educated at Christ’s College, and Canterbury University College, Christchurch, New Zealand. Over forty years on these three books are still very readable. Each contains all sorts of interesting and not often repeated information. Sea Anglers’ Fishes of New Zealand also includes an interesting table showing the average, and maximum, length and weight of the species covered.